If you&apos;re a diehard Castlevania fan with a lot of extra cash to blow, you may want to bid on this awesome Symphony of the Night lithograph signed by the insanely talented concept artist Ayami Kojima (no relation to Hideo Kojima) for the game&apos;s launch way back in 1997. 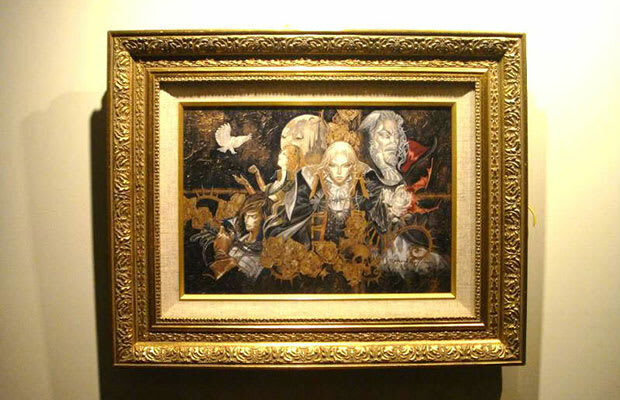 The starting bid of $9499.99 may seem like a lot for a signed piece of artwork, but aside from the overall effort, which includes the ornate original frame, a frame hanger and prize letter – it was apparently a piece limited to one created for a "biggest Castlevania fan" contest before Symphony&apos;s release. The only thing that would make the package cooler was if it were an actual oil painting. As if that weren&apos;t enough, the seller also has a treasure trove of other extremely rare game merch for sale, including a mint-condition music box that plays Aeris&apos; theme from FFVII and a slew of other goodies from Final Fantasy, Metal Gear, Castlevania, Mario Bros. and many others. It&apos;s a pretty wild collection.